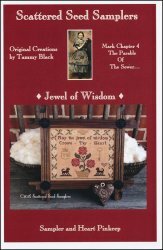 Jewel Of Wisdom [D1376] - $12.00 : Yarn Tree, Your wholesale source for cross stitch supplies. Cross stitch pattern by Scattered Seed Samplers. The verse "May the jewel of wisdom crown thy heart" is accented by floral motifs, a crown, a place for initials, and other motifs. Stitch count 130w x 106h.